Whether you’re traveling, hiking, hunting or bird watching, binoculars can come in very handy! Binoculars provide the ability to get a close-up view of something that is far away. It could be anything from a boat out at sea or a deer on the other side of a valley. Whatever the case, modern-day binoculars are designed to offer optimal vision while being portable, lightweight and affordable. If you’re keen to get started with a great value pair of binoculars, you’ve come to the right place. Here you will find our detailed reviews of binoculars under $200. You can learn all about their various features and pros and cons. What’s more, we’ve even included an in-depth buying guide which is packed with further details on features, accessories and more! So without any further ado, let’s get started! One of the reasons why the Nikon 16003 Prostaff 7S is our top pick is that there are just very few faults to find. 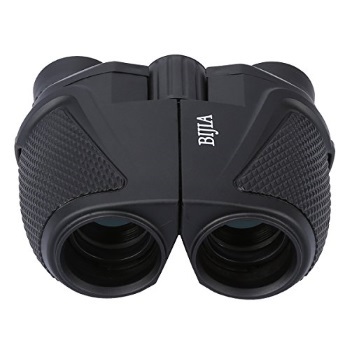 This is a great all-around pair of binoculars that can be used for all sorts of activities such as hiking, hunting, and bird watching to name a few. One of the reasons for this is the excellent color and clarity provided by the fully multi-layer coated lenses. The only thing we really dislike about this product is the lens covers which are cheap and flimsy. Thankfully this is a minor point and easy to see past thanks to the various advantages. The quality of construction is well worth noting. The body is rubber armored which has a number of benefits including durability and comfort. A rubberized grip makes these binoculars much easier to hold even when the weather takes a turn for the worse. Another element of comfort provided is via the turn-and-slide rubber eyecups. These are great because they let the user change the distance between eye and eyepiece. Those with glasses will find such eye relief particularly useful. 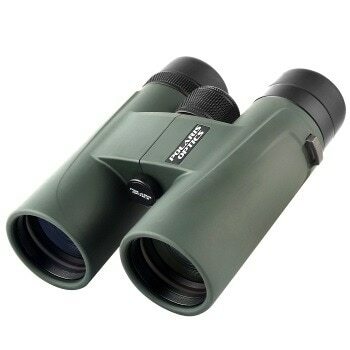 Quite simply, these binoculars are perfect for hunting and birding and come in at a great price. What’s not to like?! A very close runner-up, the Bushnell Excursion HD 242410 is very much worth considering. 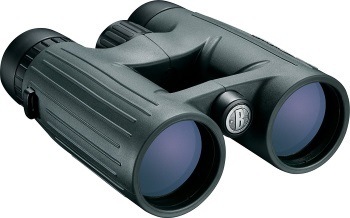 Another great value pair of binoculars, they offer 10x magnification through the 42mm objective lenses. The field of view offered is nice and wide which many people appreciate. The glass is lead-free while optics are fully multi-coated. As such you can expect clear images with colors that are true to life. When it comes to activities such as bird watching, this can be particularly important! In terms of construction, the housing is lightweight yet rugged which is a nice balance to strike. Waterproof and fogproof, you can take these binoculars anywhere at any time, no matter the weather. We particularly appreciate the good size and weight which makes the Bushnell Excursion HD really convenient for long hiking or hunting trips, for example. Much like other budget options, the lens caps of this product aren’t the best and are prone to falling off. However, this is one of very few cons to consider. Finally, we should mention the lockable center focus knob which makes changing focus very easy. If you have any doubts about this product, know that it also comes with a limited lifetime warranty. Coming in as one of the cheaper options we’re covering, the Gskyer AX14-7X50 is undoubtedly the best for the money, particularly when you consider what it has to offer. Images provided by these solid, all-around binoculars are sharp and bright thanks to the fully multi-coated optics. At 1000 yards, you can see up to 357-feet field of view which is quite respectable. As with most binoculars on the market, this product has a rubberized exterior which serves a few purposes. First of all, it provides excellent grip even in wet conditions. Secondly, it serves as shock absorption in the event of any accidents! 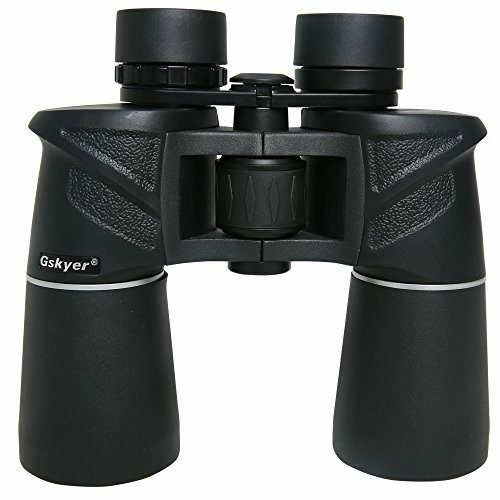 Another feature that makes these binoculars from Gskyer good value is the twist-up eyecups. We think that these are very useful, particularly for people who wear prescription glasses or sunglasses since they prevent lens scratching. 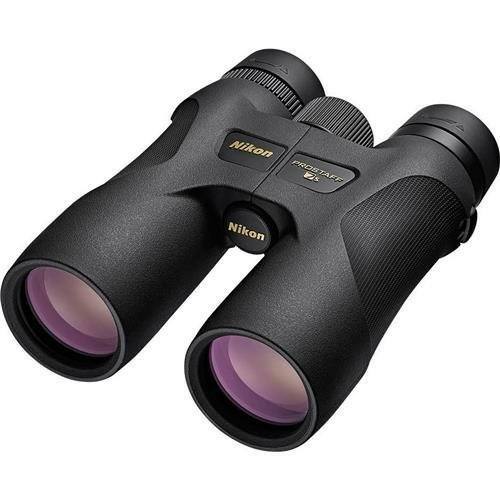 In our opinion, these binoculars are very versatile and very well suited to a range of activities including bird watching, hunting and watching stadium sports, for example. The only problem with this product is that it only comes with a 1-year warranty which we feel is just not enough. While the product is inexpensive, it’s still nice to have that peace of mind that a good, lengthy warranty provides. Another great value option is the Polaris Optics NaturePro. This is a very solid choice thanks to its durability. It’s both waterproof and fogproof which means you don’t need to worry when it starts raining, for example. Despite being fairly rugged, it’s not at all heavy. Weighing 1.5lbs, it’s very easy to transport and won’t weigh you down even if you’re on a lengthy hunt or hike. In terms of visuals offered, they’re very high quality for the price. Fully multi-coated with phase correction, we found the color clarity to be very impressive. This can be of the utmost importance when distinguishing between similar birds or trying to see through dense foliage on a hunt. Since we’re on the subject of optics, it’s worth us mentioning that the Polaris Optics NaturePro has a range of up to 1000 yards. We’ve found that this is more than enough for most binocular needs. There’s also a field of view of some 430-feet which is yet another impressive thing about this product. Since this is a more budget option, don’t expect the optics to compare to top-of-the-range binoculars. For example, they may not perform as well as expected in lower light conditions. What’s more, the focus is not as easy as it should be so this is something to bear in mind if you’re new to using binoculars. You can’t get much cheaper than the G4Free! And while this option may be ideal for those on a tight budget, that doesn’t mean that they don’t offer some quality. For example, the 12x magnification with 25mm lens is surprisingly high-powered for the price. Not only do you receive the binoculars upon purchase, you also get a strap, carrying pouch and cleaning cloth. As you’d expect, these aren’t of the best quality but you get what you pay for! We feel that these particular binoculars are suitable for a wide range of activities such as casual bird watching and hiking. Something that surprised us about the G4Free binoculars is that they’re waterproof and have an anti-fog lens. Many binoculars within a similar price range cannot claim the same. At 5.3 x 5.1 x 2.6-inches, they’re fairly compact which makes them well suited to those who need to travel light. They could also be used by concert-goers who require an inexpensive yet smaller set of binoculars for seeing the stage up close. So if you don’t mind average optics then this is a very low-risk purchase with plenty of advantages and very few cons to consider. The first question you should ask yourself is what you will use your binoculars for. This may seem like a silly question but it really isn’t! There are all sorts of binoculars that are designed for specific activities. For example, you may want a pair of binoculars for astronomy, bird watching, hunting or simple for when you’re out hiking. Many binoculars are designed to be good, all-around products. However, some are designed with a specific activity in mind. Do I want power or portability? Once upon a time, it was difficult to get real power or portability in a budget pair of binoculars. Nowadays, advances in technology mean that you’re not limited to average products. While you may well be able to find some binoculars that have both, try to decide if power or portability is most important to you. Bigger binoculars tend to be more powerful but they’re heavier as a result. If you’re taking long hikes, you may want something more compact. But if you’re watching birds from a great distance, you may need good optics. We assume that you’re trying to set yourself a budget of under $200. That’s no problem! In fact, there’s a lot of room to work with. It’s worth knowing that you can find decent binoculars under $100! Imagine the difference in quality between those that cost $50 and those at $200. We feel it’s well worth investigating things like what sort of magnification they offer, whether they’re waterproof and if they come with a good warranty. You’re right to ask this question. Glasses wearers have to consider the subject of eye relief when it comes to using binoculars. Eye relief can best be explained as the distance from the very edge of the eyepiece to your eye. If you wear glasses or even sunglasses, it’s better to look for binoculars that offer longer eye relief. This will help you see the whole picture without any restriction. What’s more, it reduces the chances of you smudging or scratching your lenses! Even some binoculars under $200 have adjustable eyecups which will prove useful. Magnification: The binoculars you buy could have a magnification of anything from 4x to 15x. Realistically, they’ll probably be between 8x and 10x as these are the most common and offer the best compromise between the enlargement of the image and the field of view. Object lens size: The size of the lenses could be anything from 20mm to 50mm. These play a very big part in the size and weight of the binoculars as a whole. If you’re looking for something portable, opt for binoculars with smaller lenses. Alternatively, if you’re seeking power then you’ll want full-size binoculars. Field of view: The field of view of a pair of binoculars refers to how much you can see. It’s measured in meters over a distance of 1000m. The wider the field of view, the easier you can locate different objects in the field. More expensive binoculars tend to have better optics and thus a greater field of view as a result. Build quality: Build quality can be compromised somewhat when it comes to budget binoculars but that’s not always the case. Try to opt for a reputable brand that provides a good, lengthy warranty. Quality products should be waterproof and fog proof to avoid water, dirt, and debris from getting in! Accessories: While accessories are often included with your binocular purchase, these are often of poor quality. In particular, we recommend that you buy a good strap to go with your new purchase. This will allow the binoculars to comfortably hang around your neck, providing the binoculars are not full-size and too heavy! If you’re unsure as to which type of binoculars is best for you, the following information should be very useful! Monoculars: Smaller and lighter than binoculars, this is a single scope and is best for short-term use. Compact: Compact binoculars are the smallest and lightest of the bunch. They’re perfect for people who need to travel light when on long hikes. We also wrote a guide about them found here. Mid-size: When you’re observing wildlife, a standard mid-size pair of binoculars will do the job. This is one of the most common types available. Full-size: The biggest of the bunch, full-size binoculars tend to be more powerful but heavier. They’re great for serious wildlife enthusiasts and also for boating. Try to make use of the strap that comes with your binoculars. Carrying them around your neck prevents the risk of dropping them and rummaging around for the warranty! If you’re not keen on the included strap then you can always buy a better one separately. If your binoculars don’t offer enough magnification for your bird watching or hunting needs then you can always buy a spotting scope. The zoom on spotting scopes can be anything from 20 to 50x. While they’re not cheap, prices are gradually coming down as quality continues to increase! Part of your enjoyment when using binoculars will come down to comfort. You can ensure that your binoculars fit your face by raising them to your eyes and adjusting them as necessary. This will help you to see one clear image which will make all the difference whatever you’re trying to see. Many binoculars have not just a central focus ring but also a diopter ring. This helps you adjust a single eyepiece to compensate for any differences between your eyes. As a result, you’ll have a much more balanced view. For reference, the diopter adjustment is usually found on the right eyepiece. One of the difficulties when using binoculars at high magnification is locating the target. Using your naked eye, try to find a noticeable nearby landmark. Keeping your eyes locked on this, raise your binoculars to your eyes and move from this towards the original target. With practice, this technique can make things much easier! Binocular lenses are delicate so treat them with care! What’s more, they can smudge fairly easily. If you notice a smudge, resist the temptation to use any old material to wipe it. Even a single grain of sand could cause a scratch. 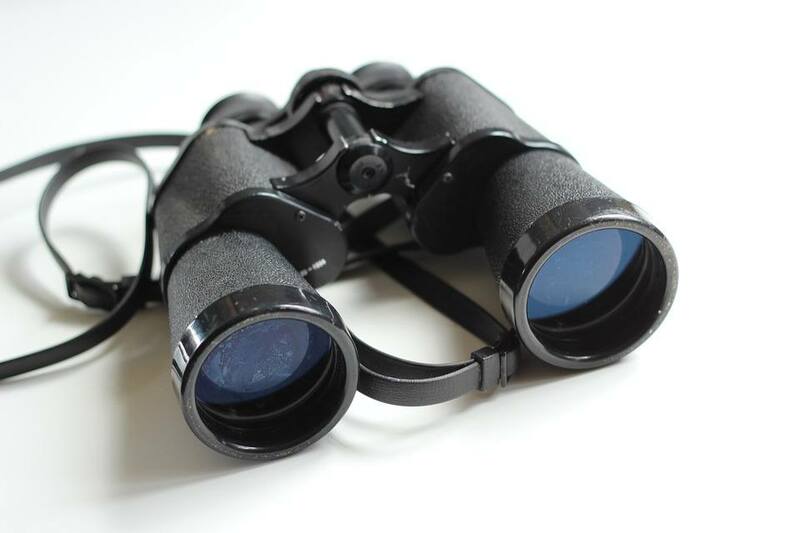 Smudges can best be removed with a microfiber cloth which may even be included with your binoculars. As you can see, there are plenty of things to consider when buying binoculars! We hope that our reviews of binoculars under $200 help you to make a quick and easy decision. Whether you’re bird watching, hunting or simply hiking, there are so many great options on the market at the moment. By using our reviews and buying guide, you should have enough information to find a great pair of binoculars for an even better price! Rest assured that technology is constantly improving and while prices are going down, quality continues to go up! Be sure to look for binoculars that are well reviewed by consumers and that have a good, lengthy warranty.